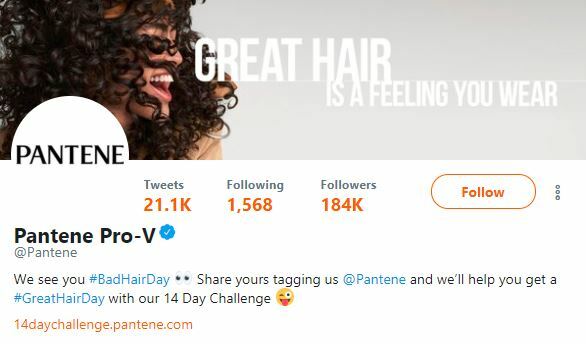 Procter & Gamble's Pantene hair care brand rolled out a social media campaign based on the large number of users who post pictures of their bad hair days on Instagram and Twitter. The brand found that Instagram users have posted 1.2 million photos with the #BadHairDay hashtag, 17 times more than #GreatHairDay, according to a press release. Pantene's "14-Day Challenge" invites Instagram and Twitter users to post pictures with the #BadHairDay hashtag to receive a personalized consultation from a Pantene Hair Advisor. The haircare brand has enlisted an "army" of social responders in a new #GreatHairDay Studio to engage with each #BadHairDay post. Pantene's #GreatHairDay challenge is an entertaining way to engage social media users while leveraging the popularity of self-deprecating photos of bad hair days. By providing a personalized consultation with individual consumers, the brand may incentivize people to participate and perhaps buy recommended Pantene products. "Challenges" are a popular genre on social media platforms and video-sharing sites like YouTube that have the power to go viral through shares and hashtags.